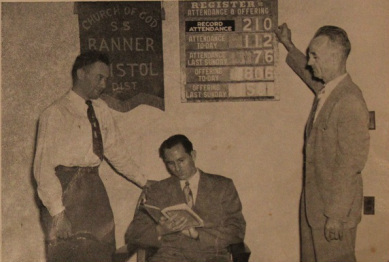 The History of "Roan Street Church of God"
In the year 1919, a revival was conducted in the Carter County Courthouse by a young evangelist by the name of Rev. L. C. Yates. From this revival, a church was organized in the home of one of the attendees and Rev. Yates was appointed the first pastor. A building was constructed on the corner of Broad Street and Lynn Avenue and the church met in this building until 1928 when the building was sold. The church relocated to Arney Street where it would stay for about 20 years. In 1947, while the Rev. Ted Moore was pastor, a tract of land on the corner of Roan and "E" Street was purchased and over the next two years a brick facility was built on the newly acquired site. The church doors at the new facility were opened to the public for the first time in 1949 with the Rev. E. A. Kern as pastor. The "Roan Street Church of God" still operates from the same location although it has changed significantly. In the 1970's a brick marquee was added by Roy Keene and his son Steve. Work was also done to the front of the church which included new steps and the old white door was replaced. A little later a large white steeple was added. In the 1990's adjoining property was purchased and much needed parking was added as well as a fellowship hall which is used by the church attendees for social functions. In 2001 the church parsonage which was located next to the church was torn down and the church was expanded to include new classrooms, a new kitchen and a large inviting foyer with a covered drive through entrance. The original brick has been covered with stucco although the beautiful stained glass windows still remain today. Several active members of this church grew up here and attended with their parents and grandparents. One of the faithful stewards by the name of Carl Estep was recognized a few years ago for 50 consecutive years of service as the financial Treasurer for the church. Carl is still active at Roan Street today. The entire Estep family has been an important part of the church for several years. Several well respected pastors have served at Roan Street which include Rev. Earl Scoggins, Rev. Earl T. Golden, Rev. Clyde F. Shanke, and current pastor Rev. Kenneth Bewley. The Roan Street Church of God still conducts Sunday Morning, Sunday Evening and Wednesday evening services. The worship music is contemporary in nature. The public is always welcome at this church. Below is a series of photos that appeared in a 1950's edition of the Spinnerette. There is also a video shot on a warm Sunday afternoon as church dismissed.